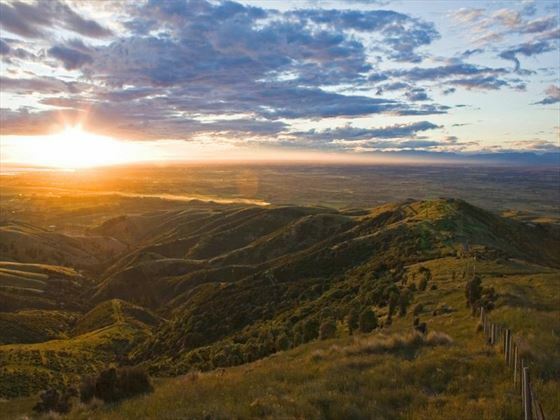 A fabulous 14-day adventure through the very best of New Zealand, the New Zealand Marvel guided tour stops off at countless attractions and locations throughout the country to offer a broad experience that you’ll reminisce about for years to come. 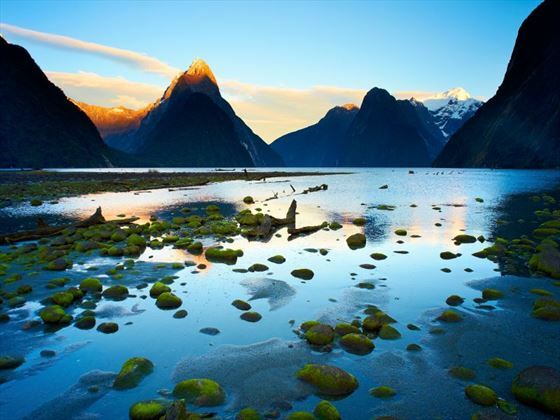 Visiting renowned destinations as the Southern Alps, Franz Josef Glacier, Milford Sound, Queenstown and Auckland, plus many more, you’ll have the opportunity to explore many of New Zealand’s wonders with the expertise and knowledge of a guide. 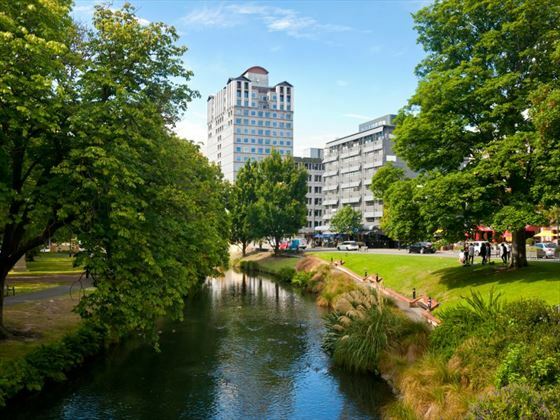 Arrive into Christchurch and transfer to your hotel for the night. The remainder of the day is at leisure, giving you chance to explore at your own pace. In the evening, attend a welcome reception and dinner with your Tour Guide and fellow travelers. 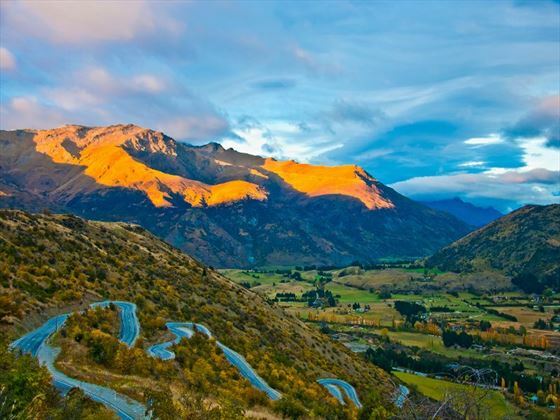 In the morning, board the TranzAlpine train for one of the most extraordinary and scenic train routes in the world. This rail journey takes you on a breath-taking ride through the Canterbury Plains and the Southern Alps to Arthur’s Pass. Afterwards, you’ll visit Hokitika which is home to the native greenstone (jade) where you’ll embark on a factory visit to see the local artists at work. 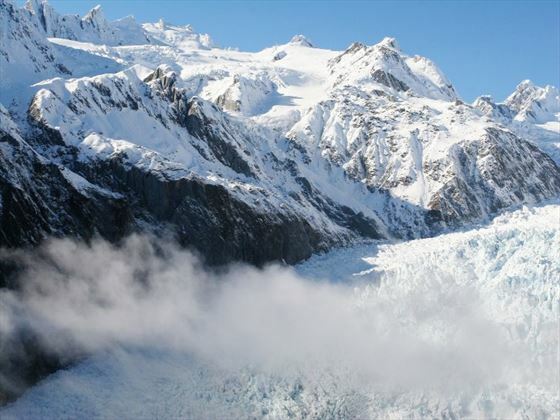 Later, visit Franz Josef Glacier which is a rare and awe-inspiring still advancing glacier. There is also an optional scenic flight available over the glacier. 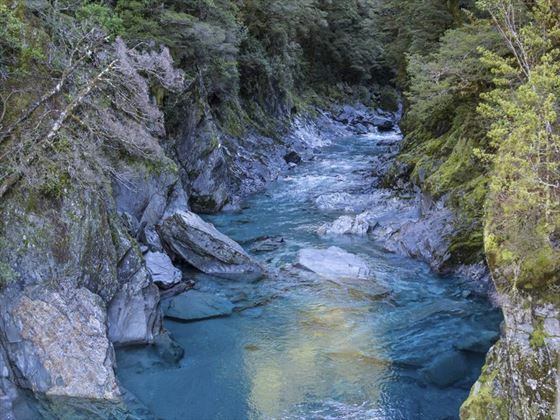 Travel through the Haast Pass to see Thunder Creek Falls and take a rainforest walk, before visiting a trio of lakes – Wanaka, Hawea and Dunstan. Sample the delicious fruit at a Cromwell orchard before visiting the historic gold mining region of Arrowtown which is set on the Arrow River. 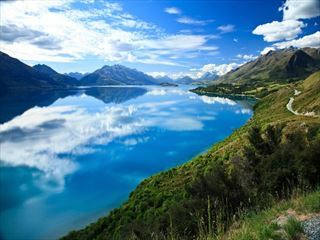 Upon arrival into Queenstown, embark on a sightseeing tour to witness the sights and sounds of this adventure capital. 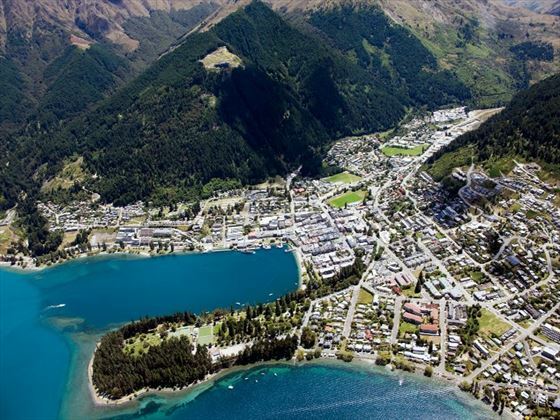 Today is a free day to give you the opportunity to sample life in Queenstown for yourself. 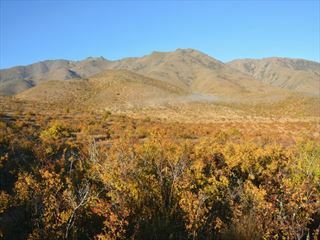 This fun-packed destination offers something for everyone, from white water rafting and jet boat rides to wine tours and scenic hikes. In the evening, cruise across Lake Wakatipu on the oldest steamship in New Zealand – the TSS Earnslaw to arrive at Walter Peak Station for a gourmet BBQ dinner at the Colonel’s Homestead. Enjoy an entertaining after dinner farm show which provides a glimpse into high-country farm life before heading back to Queenstown. Today sees you travel along the Devil’s Staircase and the shores of Lake Wakatipu to arrive at Te Anau. 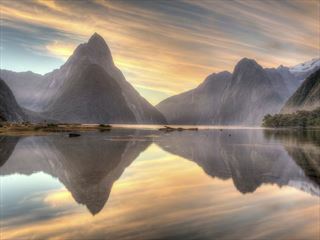 The beauty of this area is astonishing, with sights of Fiordland National Park visible en-route to Milford Sound where you’ll take part in a cruise across this sensational natural wonder. Along the way there will be countless photo opportunities including the Chasm, Mirror Lake, Pop’s Lookout, Mitre Peak, Bowen Falls and Cleddau Valley. Afterwards, return to lakeside Te Anau where there will be an optional visit to the Te Anau Glow Worm Caves. Cross the sheep-farming lands to Dunedin today where you’ll have time for a city tour. In the afternoon, enjoy some free time where you may wish to consider a wildlife cruise to see the royal albatross and penguins. Alternatively, you could visit the Cadbury Factory or ride the Taieri Gorge Railway. Before making your way through Oamaru you’ll have the opportunity to visit Larnach Castle, which is the only castle in New Zealand. Pass limestone buildings, the Waitaki Hydro Power Scheme and Benmore Dam before reaching Omarama. Admire the beautiful scenery of Mt Cook National Park today, with an optional scenic flight available, where you’ll see Lakes Pukaki and Tekapo, visit the Church of the Good Shepherd and journey across the Canterbury Plains to reach Christchurch. Venture alongside the Pacific Ocean coast to Kaikoura which is famous for its amazing whale watching activities. (There is an optional whale watching flight available) Visit the fur seals at Ohau Point and pass the Grassmere Salt Works before traveling to the picturesque seaside village of Picton for an orientation tour. Today sees you cruise Queen Charlotte Sound and head across the Cook Strait to Wellington where you’ll take part in a city tour before enjoying some free time. Afterwards, visit the Te Papa museum of New Zealand to learn more about the culture, history and art here. Travel along the Kapiti Coast to Tongariro National Park to discover the alpine scenery of Mt Ruapehu. Afterwardsm visit Taupo and drive along the shores of New Zealand’s largest lake, before viewing Huka Falls and passing the Wairakei Geothermal Power Station. Visit the Agrodome Sheep Show – an award-winning stage show – where you’ll catch a glimpse of farm life in New Zealand. There will be sheep shearing demonstrations, sheepdog herding, cow milking and the chance to bottle-feed lambs, plus much more. 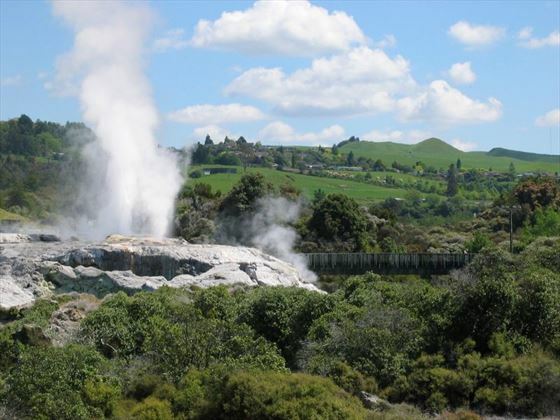 The afternoon is at leisure so why not visit Rainbow Springs or Te Puia where a local Maori guide will show you the geothermal valley with its mud pools and geysers. In the morning, travel through Waikato farmland to the Waitomo Caves to see the amazing underground Glow Worm Grotto by boat, with the chance to walk through the astonishing limestone caves. 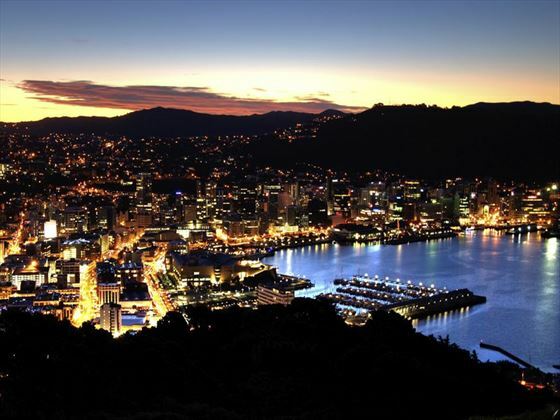 Afterwards follow the Waikato River, which is the longest river in New Zealand, into Auckland – enjoy the views of Mt Eden before heading to your hotel for an evening dinner with your group to celebrate your trip. Enjoy breakfast then transfer to Auckland Airport for your departing flight.